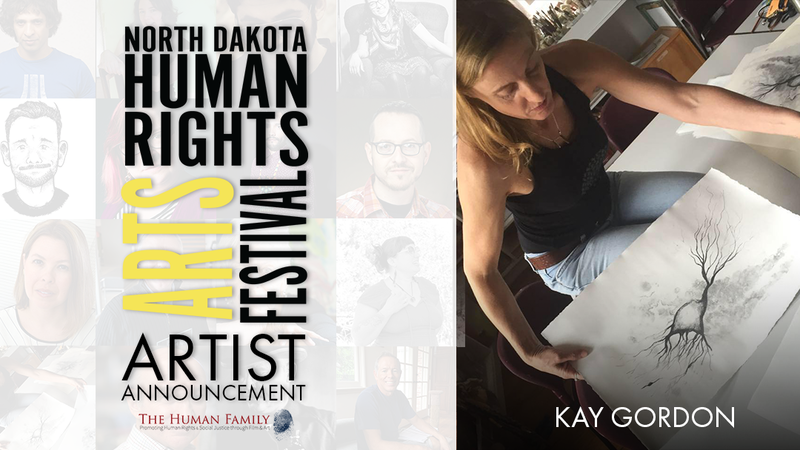 Kay Gordon’s “I feel so honored” is currently on display at the 2019 North Dakota Human Rights Arts Festival. “I feel so honored” is part of an ongoing series of mixed media pieces exploring the presence of absence and how we feel a loss as an ever-present/consuming or filling presence. As examples, loss due to violent death & disease, especially those caused by human-created conditions (war, climate change, etc. ), or the loss of homeland for refugees & asylum seekers (i.e., to be not at home anywhere, as Hannah Arendt & Giorgio Agamben have explored: “human rights” are in reality on “citizen rights”, for if you are not attached to a state, you have no rights at all…). In this work Gordon has obliterated most of the text, except for the statement “I feel so honored”, she has cut out one figure, and then in the rest of the photographic image, she has, with a very limited palette (4 colors), obsessively matched the color of each detail in the photograph and painted over it with a fine brush, a problem-solving and tedious and almost invisible work. Visit the festival at one of its three stops in North Dakota to experience Gordon’s “I feel so honored”. Gordon works in diverse media: lithography, etching, mixed media, drawing, installation, & objects/sculpture. Fundamental themes in her work are the balance of chaos and order, and the dependency of one object’s juxtaposition to the next to reveal its form or even create its existence. Sculptures and installations include drawing, with wire, thread, shadow, on a variety of surfaces and in space. The formal composition creates a framework for revealing subconscious concerns, fears, and dreams. Recent work responds to the violence, and ensuing tragedy, of current political, religious, and natural events/human-created events. Kay is a Brooklyn based visual artist, working in the Brooklyn Navy Yard. She has exhibited internationally, and is in private collections in Berlin, Caracas, & the U.S. Current & recent exhibitions include a solo installation, “Memoryscape” at The Space Station – This Friday or Next Friday Gallery, Brooklyn; “Uprooted” at IA&A at Hillyer Gallery, Washington, DC; “Art of Armistice” at Target Gallery: Torpedo Factory, Alexandria, VA, and “Metamorphoses” at St. Josephs College, Brooklyn, NY. Recent exhibitions include a two-person installation, “I’m broken on the alphabet” at Millersville University with collaborator Maya Pindyck; “(Social) Status: Update,” Nurture Art, Brooklyn, NY; “CREATE/Change,” IA&A at Hillyer Gallery, Washington, DC; “Interludes/Unfinished,” Target Gallery, Torpedo Factory, Alexandria, VA; and “Small Art,” Gallery Shoshinkan, Nagano, Japan. Current & forthcoming publications include “Neurons/Deterritorializing” in Capacious: Journal for Emerging Affect Theory and “Impermeable (Raincoat for Katrina)” in The Capilano Review. Learn more about Balisle’s work at her website www.kaygordon.com or on FaceBook or Instagram. The Second Annual North Dakota Human Rights Arts Festival and includes the work of thirty-five 2D, 3D, filmmakers, and live performance artists from around the world. The exhibition is currently on display at the Bismarck Downtown Artist Cooperative in Bismarck, North Dakota. Each artist explores human rights, civil rights or social justice issues through their respective mediums. In addition to paintings, mixed media works and photographs, a series of experimental videos will also be a part of the festival. Live performance works will take place during an artist reception scheduled throughout the festival. The North Dakota Human Rights Arts Festival is supported through the generosity of the Consensus Council. The Fargo portion of the exhibition is made possible by through a Community Arts Partnership Project grant through The Arts Partnership, the generosity of the City of Fargo’s Human Relations Commission, the City of Fargo’s Native American Commission and through a partnership the North Dakota Human Rights Coalition. Established in 2017, the mission of the North Dakota Human Rights Arts Festival is to educate, engage and facilitate discussion around local and worldwide human rights topics through the work of artists. For more information about the festival, visit www.human-family.org.